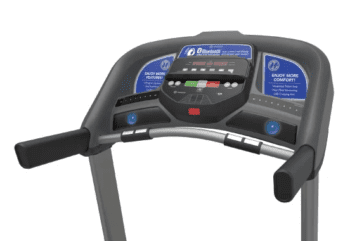 Horizon Treadmill T101 Review by Industry Experts! The Horizon Treadmill T101 is On Sale! “Best Value Buy Treadmill” on the Planet…seriously! The Horizon Treadmill T101 is the #1 selling fitness treadmill with approximately ½ million units sold. It typically sells for around $699. What makes the T101 an attractive offer for a budget treadmill is the fact that it has a reputation for being very low maintenance. It also received a number of “Very Good” ratings in several categories by a prominent consumer magazine. This included construction and exercise range. The T101 is also well constructed, as are all Horizon Fitness products. Be aware that the Horizon treadmill T101 is primarily designed for walking, although it should withstand the abuse of moderate jogging. MID-WEEK SALE ENDS THURSDAY: The Horizon T-101 is ON SALE for $799 and they are throwing in FREE Shipping. High Quality Motor: The 2.5 continuous duty HP motor is built by the manufacturer specifically for the Horizon treadmill T101. This is not an off-the-shelf motor bought by a third party. In fact, all of the product parts from Horizon Fitness models are designed specifically for their machines to provide seamless integration and less maintenance issues. This motor runs smoothly and very quietly with a peak performance at a lower RPM. Straight Forward Design: We also really liked the ease with which this straight-forward machine can be operated. The folks at Horizon Fitness advertise a 30-minute assembly. Once using the treadmill, speed and incline can be adjusted with a single touch using their quick select keys. 20” x 55” running surface – Adequate for users of average height or less. Up to 10% incline – Engaging the power incline is a great way to target different muscles and to increase the intensity of your workouts. Bluetooth Connectivity – You can now wirelessly connect your favorite device to the T101’s integrated speaker system and listen to your favorite playlist while you work out. 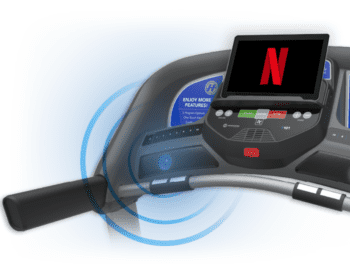 This means you can watch Netflix and listen to the audio through your treadmill speakers. Pretty cool! Integrated tablet holder and USB charger – If entertainment while you sweat is a must, then the T101 now has you covered. Use the integrated tablet holder in combination with the rapid-charge USB port to keep your video going as long as you are. Backlit LCD display – Monitor your progress on the easy-to-read display window. 30 workout programs – The program variety is sufficient to keep you motivated and challenged. The programs focus on different goals like distance training, interval training and calorie burn. Speed capacity up to 10 mph – Adjustable with typical arrow keys or quick select keys for easy use during your workout. Contact heart rate monitor – Allows you to monitor your heart rate during exercise to determine whether you need to slow down or pick up the pace. Cooling fan in the console – Provides a moderate relief when you’re working up a good sweat. Music connection so you can plug in your iPod and listen to music directly from the treadmill’s speakers. Folds for easy storage – Great feature for saving space when the treadmill is not in use. The Feather Light Folding makes it easy to raise and lower. When lowered, the machine descends slowly and in a controlled manner to avoid accidental injury. 2.5 HP continuous duty motor – Sufficient for walking and light jogging. This may seem like a very small motor when you compare it to the monster horsepowers available from other brands. Remember, Horizon builds all of its own components, so this Johnson Drive motor is able to run efficiently at a lower RPM, require less fans (quieter overall) and require less maintenance. Short story – don’t dismiss this machine just because of the lower horsepower. Warranties – Lifetime on frame and motor; One year on parts, cushioning, and labor. For a budget treadmill, the Horizon T101 is a great value. We would rate it one of the best values at $700, although any treadmill at this price range has some limitations. In fact, it received our “Best Buy” award in this pricing category against the competition. Horizon has excellent customer service and the company’s vertical integration means they make their own extremely reliable parts. We have personally been on this machine and – for the price – nobody can beat it. It falls in the budget treadmill category, since it isn’t as stable as a heavier, more expensive model. In general, it is not built for the abuse that comes from running and heavier individuals. While mostly low maintenance, the belt on this treadmill is still going to need lubrication every 150 miles or so. The T101 does come with a few convenient features, including the LCD display, the MP3 docking station with speakers, and the power incline. The speakers add a nice touch, allowing you to listen to inspiring music as you burn the calories. The cooling fans are also an added extra. It directs the cool air right at your core. Although the Horizon T101 treadmill comes with a heart rate monitor, you have to grab onto the contact sensors to have your heart rate read. This can be awkward for some individuals to do while they are exercising, and the readings are not as accurate as wireless heart rate monitors can provide. If you are looking for a more sophisticated option for heart rate monitoring, consider one of the other Horizon models with an included Polar Wireless Receiver. Realize the Horizon T101 is a mid-range budget treadmill. It is not heavy duty and not as durable as more expensive models. If you can afford it, consider a model in the $1,000 price range like the Horizon Elite T5, or Horizon Adventure 5. They are more stable and durable with better warranties. But if your budget is limited, then the Horizon T101 is one of the best values at the $700 price range. Received this treadmill 2 days ago. Very easy to assemble. Quality construction. Very quiet motor. Heavy, but easy to roll to desired location. I was very pleased with my purchase. I had researched treadmills quite a bit before deciding on the Horizon T101-04. Most of my research stated that this was a good value for the price point and I would have to agree. The unit is sturdy, smooth and quiet. I weigh 230 lbs and the T101-04 didn’t have any issues. You will need 2 people to move the box. Assembling it was straight forward, 3 basic steps took about an 45 minutes to an hour. I researched alot of different treadmills, but this one seemed to the best for the money and I wasn’t dissappointed. great treadmill and for the price range you can’t beat it. Go to www.HorizonFitness.com to learn more.